Do you want learn other language? If you do maybe you have some language tapes, CDs, books, or software. 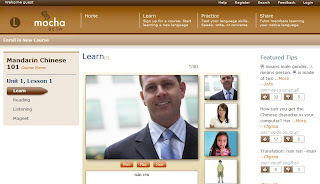 Now you have another choice that is learning language online. Maybe it will be another experience, but it is free, you do not need buy anything, just open website to learn several sentences a day. Livemocha is a language learning site, that offers several languages including English, German, Chinese, Spanish, French, and Hindi. You can choose language that you want learn, and step by step to practice everyday. Actually, all lessons are basically, so you do not need worry about something. Just like entertainment, you can pick different ways: learn, listening, reading, and magnet. It is fun. Another good point is if you know some other language you can test your language skill there. Another nice language learning site is Mango Languages, that also offers some nice language lessons. I think it looks like a language community. More detail you can check Ghacks that introduced Mango Languages.